Just finished making the Pumpkin-Tomato Soup I started the other day (see below). Delicious, if I do say so myself. For a speedier, pantry-based version, you can make this with canned pumpkin (not pumpkin pie filling tho), but come on, bake a pumpkin! 4 cups fresh (see below) or canned pumpkin, or substitute/combine winter squashes like butternut, kabocha, etc. See notes below for more options/subsitutions. Split a medium to small cooking pumpkin (not the big carving ones, which aren't all that flavorful) and scoop out the seeds. (Save those to roast.) No need to peel it, just cut it into 3x3 chunks and spread in a single layer in 1-2 lightly oiled baking dishes. Optional: add a couple of cloves of peeled garlic. Sprinkle with salt, black pepper, and smoked paprika and toss to distribute. Cover with foil, then bake for 30-45 minutes at 400 (until the flesh is soft and easily pierced with a fork). Uncover and bake 10 more minutes, until pieces brown a bit. Remove from oven and set aside until cool enough to handle. You'll want to peel the pieces (really easy now, just scrape with a spoon) before you proceed. Depending on the size of your pumpkin, you will have 4-8 cups of cooked chunks. If your pumpkin is huge, the recipe below is easily doubled and freezes well. Or, you can just mash and enjoy the leftovers as a side dish. For every 4 cups of pumpkin, you'll need 4 cups vegetable or chicken stock and 1 can of whole peeled tomatoes (15 oz). Put peeled chunks into a large bowl if you have an immersion/stick blender. (I recommend this way, easiest and less cleanup.) Or into the food processor. Add tomatoes and their juice. Add stock. Puree. Check for seasoning. Then add 1 tbsp of maple syrup (for every 4 cups of pumpkin) and salt and pepper if needed. Optional but highly recommended: add 1-2 chipotle peppers in adobo sauce. (I am a Texan, so I added four plus all the sauce in the can to my 8-cups-pumpkin batch.) Puree and check for seasonings again. Other options: if you don't have chipotles on hand (um, why not? food of the gods!) but would still like some spiciness in your soup, try a couple of tsps of chile powder (which vary wildly, taste yours first and add to taste) plus a dash of cayenne and 1-3 tbsp of a good smoky barbecue sauce. You may even want to skip the maple syrup if your bbq sauce is a sweeter one. That's it, OK? You can garnish this with a dollop of [insert]Better Than Sour Cream[/insert] or even some crumbled goat cheese if you wanna get fancy, but it doesn't really need anything. Julienned spinach or chopped parsley would be good on top if you want some green. Reheat gently, adding more stock to thin if necessary. *This is my own adaptation of a recipe called "Pumpkin-Tomato Bisque" (despite it containing no cream or milk) from Crescent Dragonwagon's (yes, that's her real name) Passionate Vegetarian, which is a excellent book and is widely available. You should get it, whether or not you are a vegetarian. Yesterday I baked a pumpkin from the farm, as well as a big ugly green-hulled winter squash (not sure of the name), seasoned with salt, pepper, and smoked paprika; threw in a couple of whole garlic cloves to roast alongside. The plan was to puree the lot with some tomatoes and stock and maybe a chipotle or two for a soup. But while the gourds were softening and carmelizing in the oven, I started in on a gumbo z'herbs, making a deep brown roux (45mins and then some); cooking some rice; chopping up the trinity veggies to saute in butter [Earth Balance*]; simmering collards, kale, mustard, and mixed braising greens (all from the farm too) with tomato juice; and whizzing up a seasoning puree of garlic, tomatoes, basil, oregano, thyme, cayenne, allspice, cloves. When the roux was ready I added it to the simmering greens and tomato juice, let it thicken on low, then added the seasoning puree and let it all mingle a while. Not that it needed it, but I browned some [soy*] sausage and put that aside. When the gumbo base was all done, it was ready to be thinned with [vegetable*] stock and ladled over the rice. OMG was that good. But it took so long I never finished the pumpkin soup I'd started. I peeled and stored the pieces in the fridge, laid the seeds out to dry (to roast with spices later this week), and I guess I'll finish that Wednesday. I'm not going to commute, since Halloween's a half day at the office. I can't believe we get farm veggies all the way through November. This has got to be the best deal on the organic planet. "Poet Will Alexander is quite ill with cancer and is undergoing chemotherapy. He's spent his life largely off the poetry grid, taking on odd jobs, and has no financial support or, needless to say, health insurance. For those around New York, there will be a benefit reading for Will at the Bowery Poetry Club, Thursday November 1, 6-8 pm (readers to be announced)." There's something wrong with the Poets in Need website (poetsinneed.org) right now, so I don't want to link there. (I just see the site file index, you?) But there's more info about the org here. *Some other postings have clarified that Poets in Need (just like the Red Cross and other such orgs) is unable to earmark donations for specific cases, so there's no guarantee donations made with Will Alexander in mind will be used exclusively to help with his expenses. However, I think it's important to point out that donations there will still help! Buffalo was a freaking blast. Kevin & Aaron are fun hosts, Rust Belt's backroom stage with its beetle-jigsawed podium, mural-painted wall, & cooler full of cheap beer constituted a real swank setup, the folks were all welcoming & funny, & I picked up some House Press stuff from the great local section, as well as Michael Kelleher's Human Scale, & Aaron Belz's The Bird Hoverer. More photos here & some from Aaron Belz too. 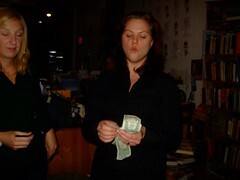 The Brooklyn reading was awesome too, but I'm not sure there's photographic evidence. Nicole always packs the place with lovely attentive not-afraid-to-hoot-n-holler people. Many books were sold, then we hit Snacky & I crashed at my sister's place while the Prius napped safely in Greenpoint. Hey, if you're near DC, do *not* miss Jennifer L. Knox tomorrow night, with Aaron Belz (again), Peter "Funcie from Muncie" Davis (with whom we overlapped Friday nite, damnit), & Michael Schiavo at Burlesque. On Saturday, I'll probably take a loooooooooong nap. Now that October is almost over, is it ever going to be October? I think it might help if people in NYC stopped wearing sandals. I dislike experts, even while I admire them for their hard work & knowledge. They're just no fun to talk to. Please place unsolicited advice in the box below. Righteous Indignation While U Wait, Or Who Needs Poetry Blogs? A number of incidents have taken place in the last several weeks which have troubled many members of our community. Although my approach may appear a bit pedantic, by setting some generative point of view against a structural-taxonomical point of view or vice versa, I intend to argue that what really upsets me is that Shanna Compton wants to replace love and understanding with stoicism and colonialism. I could write pages on the subject, but the following should suffice. You don't have to say anything specifically about Shanna for her to start attacking you. All you have to do is dare to imply that we should do something good for others. To be blunt, there is still hope for our society, real hope -- not the false sense of hope that comes from the mouths of iconoclastic grifters, but the hope that makes you eager to chastise her for not doing any research before spouting off. Shanna operates on the basis of an unremitting hatred of civility and decency. Hard to believe? Then consider the following statement from one of Shanna's wishy-washy, cankered votaries: "Delirious cowards should be fêted at wine-and-cheese fund-raisers." Pretty unrestrained, huh? Well, I am a law-and-order kind of person. I hate to see crimes go unpunished. That's why I unmistakably hope that Shanna serves a long prison term for her illegal attempts to judge people by the color of their skin while ignoring the content of their character. And that's it. Shanna Compton's ventures, like opium, hashish, or alcohol, keep the canaille in a trance and oblivious of reality. Know what a turtle is? Same thing. About to go see it at the Ziegfeld (1927-cool), for only the second time on the big screen in muh life, one of my favorite movies ever. RAWK. & the books are not pink this time. This means there will indeed be books for Buffalo & Brooklyn. Rock. Will probably go live in the store this weekend, with Amazon, Ingram, etc. to follow within a few weeks. I knew something was wrong when I opened the door. The guy in the UPS uniform was somebody I used to know, somebody I didn't particularly like. He didn't seem to recognize me back though, handed me the fat clipboard and stylus to sign, turned, walked back to the truck by the curb. I looked down at the box on the porch. I can't remember if I brought it inside or opened it right there. They looked fine, at first. Then I picked one up and opened it. My vision swam. Or I just couldn't read for a second. Too nervous? No. The book was full of INCOMPREHENSIBLE POEMS BY SOME OTHER POET! ...just wanted to point you to the Bloof Blog, which is now functionally integrated with Blogger. Rock. So Bloofy news will more likely appear over there than here, unless it's also personal. Please bookmark & blogroll it? "Coral is far more red than her lips' red"
Got the test copies of For Girls today and was surprised-slash-dismayed (well a bit) to see the cover'd come out with a pinkish cast allover. My book, she blushes! A PINK book called FOR GIRLS (particularly seeing as how it mocks exactly such girlish conventions) just will not do. The Cover Girls were lovely in their dying sunlight, still, but the "antiqued ivory" (meant to be reminiscent of an age-foxed page) was positively rosy. But no such roses see I in her cheeks"! "the freak will inherit the mirth"
Poetry can take a joke, you know. Launch party details & October readings (Buffalo, Brooklyn) are on the events page. For Girls is so next...uh, in about a week. I'll give it one last proofread tomorrow & if everything is OK, they'll go on sale. Jennifer Michael Hecht has a new book on happiness. Since more men than women voted, B) and C) tied for People's Choice, though I think A) may have edged them out by late yesterday. Among the voters who have actually read the poems, C) was found to be all wrong tonewise (too funny, unless the man was cropped out). D) raised concerns the irony might be lost (though I think the pansy-headed fairy on the back cover might have solved that problem). B) apparently looks too much like Pattie McCarthy's Verso, which I hadn't seen. Graphic designers & bookstore employees preferred A) as looking least like a poetry collection and as being most distinctive in general. I have through Wed. to decide for sure, but I think I will be going with A)--it was tied with D) as my personal fave all along anyway. It will be getting a few further tweaks. I will post it when it's final. Thanks to everybody who weighed in, here or backchannel. It was a big help.